Mukae-zuki is a technique that you execute a thrust when your opponent is actually coming towards you. You probably see people stopping their opponent with their shinai pushing against their opponent’s throat. That is mukae-zuki and if you do it with a full force, your opponent will fall down or “fly” back. So you know it's dangerous. I told my students how dangerous it could be and they shouldn't be doing that unless they have a good control over their shinai. A good control means you can pull out of your shinai from your opponent’s throat when you think it would hurt your opponent if you keep your shinai where it is. You must be able to stop your sword from hurting your training partner. That is a must-have skill if you want to execute a tsuki. And you must have experienced a lot of tsuki. Many people want to execute tsuki because it looks cool. That’s fine. But have you received a lot of tsuki? Do you know how to receive a tsuki properly? If you don't know or you haven't received a lot of tsuki, you have no rights to execute tsuki. Simple. If you know how painful it is, you would not use it so easily, unless your opponent or training partner knows how to take a tsuki. If you do it knowing that your opponent doesn't know how to receive it, then you are just a bully. A bully isn't an appropriate word. You know your opponent/training partner doesn't know how to receive a tsuki, then you do it, you are trying to hurt him/her. You are worse than a bully. Kendo is to train "one’s human character through the application of the principles of the katana". The training itself is very hard. Through hard training, we can see true selves and that is why we can improve ourselves. But many people mix hard training with violent training. If you try to hurt others on purpose, then it is no longer training. It is a public execution. 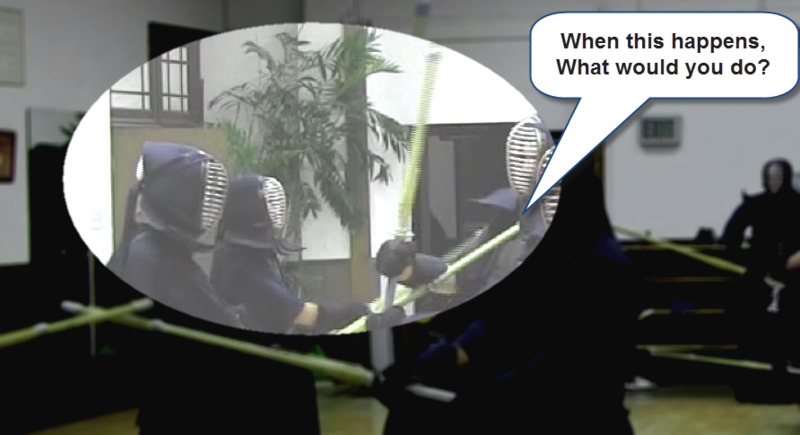 You are executing an innocent person through kendo. That is absolutely wrong. He Ran into My Shinai? Absolutely this shouldn't be a phrase coming out of a 1-dan who cannot even control own shinai. This person, student A, is still so afraid of tsuki and I had to tell the other sensei to stop tsukiing student A. But now this person is doing mukae-zuki against a brand new beginner who just put his men on for the first time. Of course, I told this person off. You may hear such phrase, “You ran into my shinai. Don’t strike when my shinai is still in the center”. Such phrase is used when a teacher is trying to teach students the importance of taking the center. This is no such case. This is a learnt behavior and copied by a person who does not know what he/she is doing, even though I told not to do it many times. People misunderstand a lot of things. People become arrogant after passing their exam. Of course, not everyone. I, myself, became arrogant and my own teacher told me off.That is life. Especially when we are young, we think we know everything. to discipline the human character through the application of the principles of the Katana (Quoted from Concept of Kendo). Mind you, kendo is a full contact martial arts and we use a weapon. The weapon is deadly when it is broken or has splinters. And the higher your grade become, the kinder/more thoughtful you must get, not more arrogant nor more snobbish. I must mention that it is a part of my fault. I have been instructing this student A from the day the person started. I am going to change the way I instruct and make sure no such things happen in the future. Lastly, the stronger you become, the more choices you will have. If you train physical side of kendo, your body become very strong and your techniques will be amazing. So you will be able to beat many people. Now you can be arrogant and start acting like a king/queen. You start looking down on others and start having an attitude toward your own teachers. That is totally what kendo does not teach. Kendo teaches to become humble and be quit yet be assertive when necessary. Be strict on yourself, love people around you, appreciate what others do for you, be loyal and honest. Be responsible with your actions. As a person, we must harmonize inside ourselves and also with others. So we must choose the latter not the former. We don’t get a diploma because this course never ends. We must educate ourselves and also pass the knowledge to the others. Yet, it is the hardest thing to teach others. Like I mentioned above, I must learn more ways to explain kendo properly so no one misunderstands the messages of kendo. Kendo is full contact and you can hurt others easily. Be aware of your responsibility on others before you take your action.